In 2003, a major blackout left over 50 million people without power across the Midwestern and Northeastern United States and Canada within a matter of minutes. 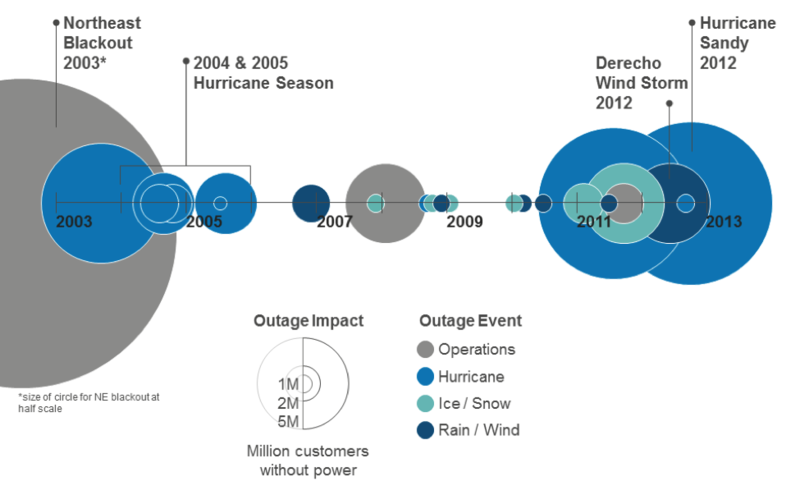 More recently, Hurricane Sandy and a rash of powerful storms brought attention to the need for improved grid resiliency, including more local operating capabilities at critical facilities. These events and others like them highlight the fact that power interruptions and poor power quality are a threat to business as well as public health and safety, particularly in light of our growing dependence on the computers, information technology, automated services and improvements in productivity that are the result of the digital age. In terms of economic impacts, Lawrence Berkeley National Lab estimates that is lost due to electricity outages and power quality events >each year. PEER outlines a comprehensive approach to reliability and resiliency that includes risk and threat identification, prevention, then mitigation and recovery. Within this category, performance is measured primarily through advanced metering and a variety of interruption metrics. Advanced meters and power interruption metrics that allow operators to track and trend performance over time and help inform future improvements. This includes multiple metrics for sustained and momentary interruptions. Capabilities for reliability and resiliency such as damage and exposure prevention, auto restoration, distribution redundancy, islanding and power surety and resiliency for critical and essential services. Power quality measurement and improvement. Identification and mitigation of risks and threats to project infrastructure such as traffic, animal intrusion, wear and aging, terrorism or vandalism and severe weather. PEER, modeled after USGBC's LEED rating system for buildings, provides energy professionals with a comprehensive understanding of how to define, assess and specify sustainable power to buildings.